This is Anja Monke. 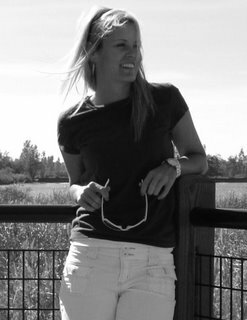 Anja, from Herford, Germany, plays on the Ladies European Tour, whe she finished 20th on the money list in 2004 and 2005. This year, Anja has five Top 10 finishes, including two runner-up finishes (KLM Ladies Open and OTP Bank Ladies European Open). Her LET profile page is here. Here's a first look at the Natalis Gulbis 2007 calendar. (The watermark is the URL of the authorized Gulbis memorabilia merchandiser.) It will ship near the first of November. You can order it here. We'll post updates in the coming weeks and also let you know when it's available at Amazon and retail. Cristie Kerr Following In Natalie's Bikini-Steps? One thing I've noticed in looking at the search strings through which people are finding Golf Babes is that quite a few people out there are searching for "Cristie Kerr FHM" or "Cristie Kerr Maxim," or other varieties. Now, I would love to see Cristie Kerr do a photo spread for one of the laddie magazines, following in her good friend Natalie Gulbis' footsteps. But she hasn't done one to this point, and to my knowledge she has no plans to do one. But perhaps my knowledge is limited (it is in every other area, after all). There must be rumors floating around about a Kerr pictorial to generate these searches. Either that, or a bunch of guys are sitting around randomly searching for combinations of hot golf babes and laddie magazine titles. So: Has anyone heard rumors about a Cristie Kerr pictorial in one of these magazines? 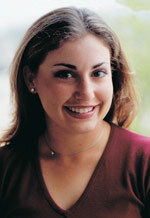 You probably know Ashley Prange as the winner of "Big Break V" on The Golf Channel. But you'll very likely soon know her as an LPGA Tour member, too. Ashley had a great year on The Futures Tour this year, winning twice and finishing sixth on the money list. Had she finished in the Top 5 in money, Ashley would have automatically gotten her '07 LPGA Tour card. Now, though, she has to make it through Q-School. Our money's on Ashley. This beautiful young woman and accomplished golf professional is Tina Miller. Tina won seven collegiate tournaments while at the University of Miami, where 2005 was a big year for her: she was in Sports Illustrated, won a Golf World Player of the Week citation, and was the school's Female Athlete of the Year. She also made the All-ACC team. She's played in seven USGA Championships, including the 2004 and '05 U.S. Women's Open, and counts Christie Kerr as a practice partner and friend. Miller turned pro in August of last year and spent this year on the Futures Tour, where she finished as the top American rookie. Tina is spending her time these days working hard on her game in preparation for the final stage of LPGA Q-School. She says her goals are "to get my LPGA card and never go back to Q-School ... (and) to one day be a top-ten girl out on the LPGA Tour." Tina, we'll be cheering for you at Q-School - can't wait to see you on the big stage! These are the two founders of a company called Myrtle Beach Caddy Girls. There seem to be a lot of these companies cropping up lately - allowing golfers (presumably male) to hire attractive young women as "caddies" - so they must be successful. However, unlike many such companies where the "caddies" are really just eye candy, Myrtle Beach Caddy Girls makes sure its employees really know their stuff. It's true that their caddies don't carry bags - perhaps they can be thought of as forecaddies - but this is due mostly to the fact that many Myrtle Beach-area courses do not allow walking. The women who work for Myrtle Beach Caddy Girls learn the courses they'll be working, employ rangefinders, assist with club selection, repair divots and ballmarks, rake sand traps, and all the other usual duties associating with caddying. The company has even joined the local business community at the Chamber of Commerce. Anyway, the two founders are Meghan Tarmey (left) and Carrin Folger. The uniform for Myrtle Beach Caddy Girls consists of a colorful polo, white skirts, and knee socks with white shoes. Personally, I like those short shorts the ladies are wearing in the photo above, which will surprise no one who's read my posts about Shi Hyun Ahn. Click the Web site link above to learn more about the company, its caddies and how to book a "caddy girl" next time you're in Myrtle Beach. This is Kelli Kuehne or, as I've always called her, Kelli Cutie. Does anyone else remember when Kelli and Tiger Woods, still amateurs, were rumored to be romantic with one another? I'm pretty sure there was nothing to those rumors (both denied it at the time). But a lot of people have forgotten that Kelli was the distaff Tiger in her amateur days. She won back-to-back U.S. Women's Amateurs, plus a British Women's Amateur. She signed a big contract with Nike at the same time Tiger did (both before they'd accomplished anything as pros) and turned pro late in the year, trying to win enough money to qualify. Tiger did, Kelli didn't. But she did make it through Q-School successfully. And she's had a solid career. She hasn't done much winning, but she's made a couple Solheim Cup teams. And then she fell on hard times. In 2003 she was No. 51 on the money list. In 2004, she was No. 60. In 2005, she fell to all the way to No. 135 and lost her exempt status. During that time period, she struggled with diabetes and went through a divorce. And she hadn't done much in 2006 until this week's Corona Morelia Championship, where she tied for fifth. With that $35,000 paycheck, Kelli moved all way up to No. 95 on the money list. Five more spots and she gets back her exempt status for 2007. I'm cheering for Kelli Cutie.